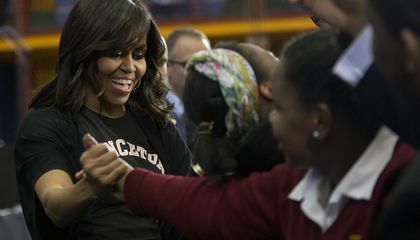 High school seniors on their way to college were feted by U.S. first lady Michelle Obama and a host of celebrities April 26. She encouraged them to make the most of their college experiences, get involved in campus life and ask for help when they need it. "We are so proud of everything you've achieved. And we don't take the struggle for granted," Obama told a roaring crowd of young people in attendance at an event in New York City's Harlem. 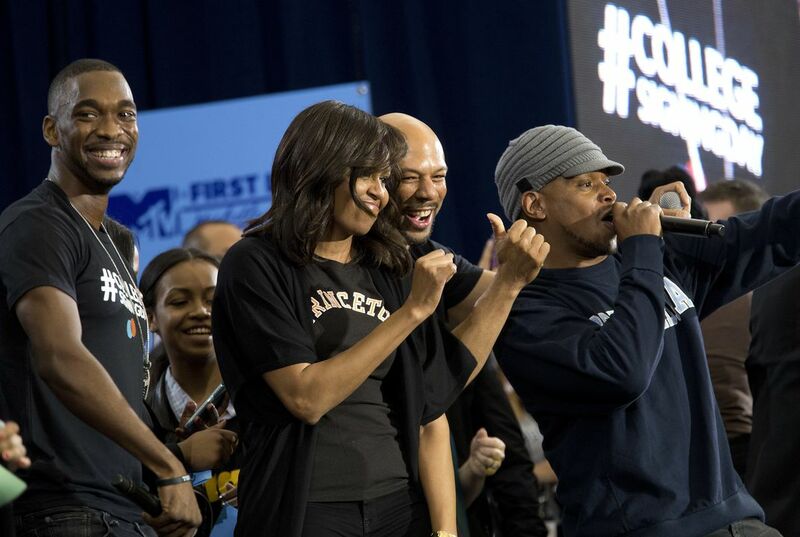 Obama was marking her third and last College Signing Day. It was part of the Reach Higher initiative she started to encourage young people to extend their educations past high school. The events were in Detroit and San Antonio the first two years. She recounted her experience starting at Princeton University, in Princeton, New Jersey. She said she felt out of her depth as a first-generation college attendee. That was until she reached out for support. The event brought out numerous celebrities. Many wore T-shirts from their alma maters. They spoke about their college experiences and congratulated the students. Among the speakers were Academy Award-winning actor Robert De Niro, "black-ish" star Tracee Ellis Ross and "Mike & Molly" star Melissa McCarthy. The New York City Department of Education is trying to boost the number of students who attend and graduate from college. The department has initiatives like starting college visits as early as middle school. Alexandra Lu is an 18-year-old senior at Brooklyn Technical High School. She said she will be a freshman at Stony Brook University in the fall. She said she was thrilled to be cheered on by such famous faces. "They made it seem like it's really exciting. So I was really excited, too," she said. Shaik Jaman, 17, will be in the first generation of his family to go to college when he attends Hunter College this fall. He said he was inspired by Obama's words. Incoming college students need in encouragement because most students are probably scared to go and many of them may not want to go and end up not going. Incoming college student need encouragement so they can continue on with their journey like in the passage it said Alexandra Lu is an 18-year-old senior at Brooklyn Technical High School. She said she will be a freshman at Stony Brook University in the fall. She said she was thrilled to be cheered on by such famous faces.They need encouragement so they have faith and so they can be hopeful that they can be someone great in life like our first U.S lady Michelle Obama. Students need encouragement to go to college because it is becoming more difficult to get there. People are getting so tired during public school and worked out to get to college people are getting tired and thinking college will be a breeze. But I think people need to continue to work hard because although it may not be pleasent at the time people need to learn good work ethics. Students need encouragement because many student struggle due to family life, low income even grades. They need to know that they can achieve there dream with help that they ask for. They might be nervous about not having that much money because they are spending it all on their education. They also could be nervous about starting a new school or not knowing anyone there. They might need encouragement about all the hard work it takes to get a degree. Collage is a lot of hard work and with encouragement some people could feel more confidant. Encouragement might also help people do good things that they would not normally do to. When some people graduate from high school, sometimes they aren't as excited as other kids about attending a college. Some of them even decide not to enroll in college at all. But some of the students just need motivation. With the right amount of it, students will feel better about attending universities in the fall. And students who said that they were not enrolling in universities at all may possibly reconsider their decision. The first lady is very enthusiastic towards young people and inspiring for their futures. The Obama's, in my opinion, are great leaders. Incoming college students need encouragement because they have already gone through thirteen years of school and start to get tired of it. College also has a reputation of being all parties and no school. So they need to remember that college is for learning and getting your major.